They say a rainy day at the beach is still a better day at home and for Kaitlin and Nathan, their Atlantic Beach, North Carolina, nuptials were perfect - raindrops and all. Even with the looming gray skies these two managed to have a colorful beachfront wedding at the bright and charming Celebration Cottage. The whole day was inspired by coastal beauty, including the invitation suite. It featured a simple design with cool color tones. 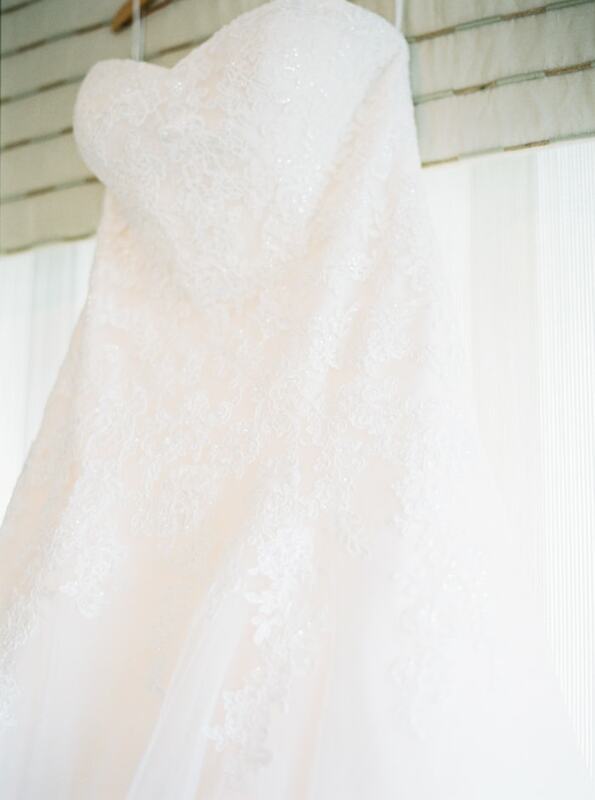 Kaitlin wore a lace A-line gown with thin straps. She also included gorgeous accessories such as rose gold jewelry, an embroidered handkerchief, bedazzled flip flops, and a pretty flower hairpiece. She added a veil for the ceremony, as well. The Celebration Cottage boasts a bright blue exterior so naturally, the couple used that color as part of their theme for the day along with pink and white. It was a seamless way to tie everything together. Guests were greeted with a handwritten chalkboard that told them who was included in the bridal party. The ceremony took place behind the cottage under a white tent. As her veil shifted in the beach breeze, Kaitlin was escorted down the aisle to her groom. The wind blew throughout the ceremony but it didn’t phase the couple. Travis, dressed in a sharp navy blue suit, held his bride’s hands as the two said “I do” in front of close friends and family. Wiping away each other’s tears, the two were joyfully pronounced husband and wife. Kaitlin’s bridesmaids wore long bright blue dresses to tie in the couple's central wedding hue. The rain held off just long enough for Kaitlin and Travis to get a few formal shots on the beach. One would never know of the presence of the less-than-desirable weather based on their beaming smiles. Kaitlin’s bouquet was crafted with blue hydrangea, white roses, and dahlias. The details for the party were exquisitely appropriate. A fan with the wedding date attached, a stick of rock candy with a “Love Rocks” note, and pieces of sea glass were just a few of the things the couple added to amplify the beach ambiance. Their cake was a simple ombre blue design made with buttercream and touched with pink garden roses. Exhausted but so happy, the couple shared one last kiss at their ceremony spot as the sun set on Atlantic Beach. It comes as no surprise that because of the beautiful beaches, easy living, and plentiful picture-worthy moments, more and more couples are flocking to the Crystal Coast for their big days. Kaitlin and Nathan didn’t let the untimely weather stop them from having an Atlantic Beach wedding that was still warm and bright in every way imaginable.